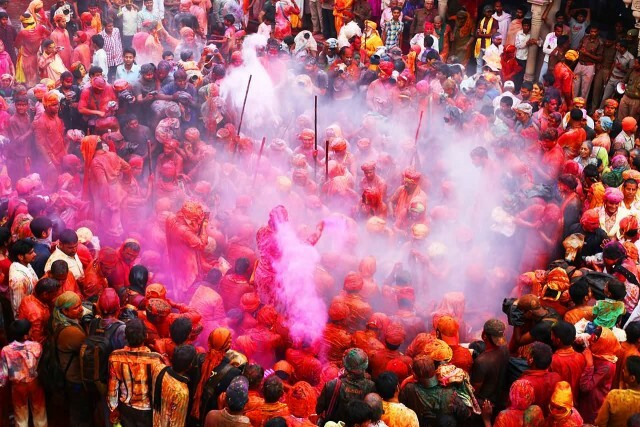 Lathmar Holi is a local celebration of the Hindu festival of Holi. 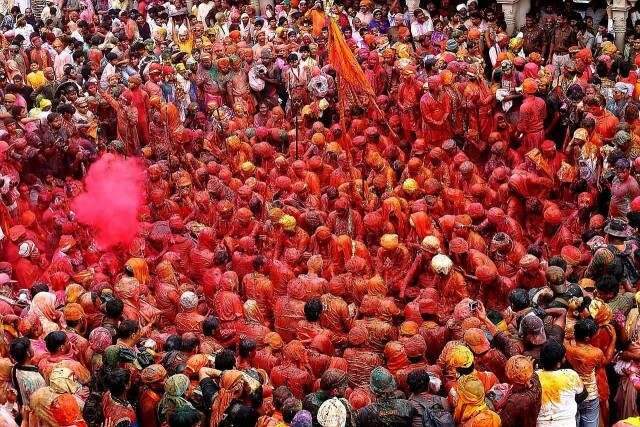 It takes place days before the actual Holi in the neighbouring towns of Barsana and Nandgaon near Mathura in the state of Uttar Pradesh. The Lath mar Holi name means “that Holi in which (people) hit with sticks”. Legend has it that Lord Krishna visited his beloved Radha’s village on this day and playfully teased her and her friends. Taking offence at this, the women of Barsana chased him away. Since then, men from Krishna’s village, Nandgaon visit Barsana to play Holi in the town which has the distinction of having the only temple dedicated to Radha in India. On the first day of Lath Mar Holi, gops (shepherds) from Nandgaon come to Barsana to play Holi with the gopis (shepherdesses) of Barsana. The festival begins with a ceremony at the Radha Rani temple. 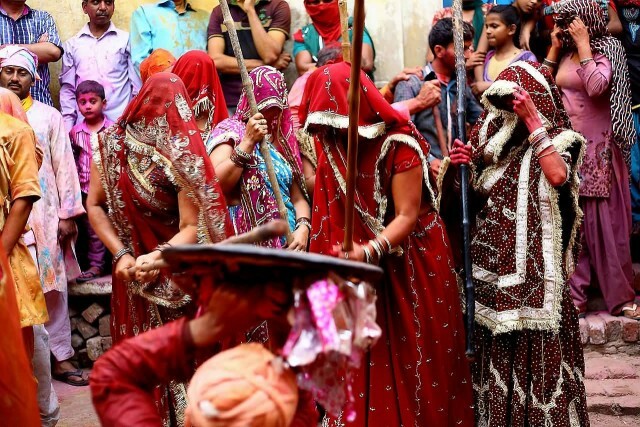 After this ceremony gops then march out of the temple on the Rang Rangeeli Gali where they stop to play holi with the gopis, who stand in groups along the street. The second day gops from Barsana go to Nandgaon to play holi with gopis at Nandgaon. Holi played at Barsana is unique in the sense that here women chase men away with sticks. Males also sing provocative songs in a bid to invite the attention of women. Women then go on the offensive and use long staves called “lathis” to beat men folk who protect themselves with shields. During intervals, participants drink ‘thandai’, it is a cold drink that is sometime intoxicating because it is laced with a paste called bhang, made of cannabis. Bhang and Holi go together. After drinking bhang, people react in different ways, some crave for sweets, others cry or laugh. 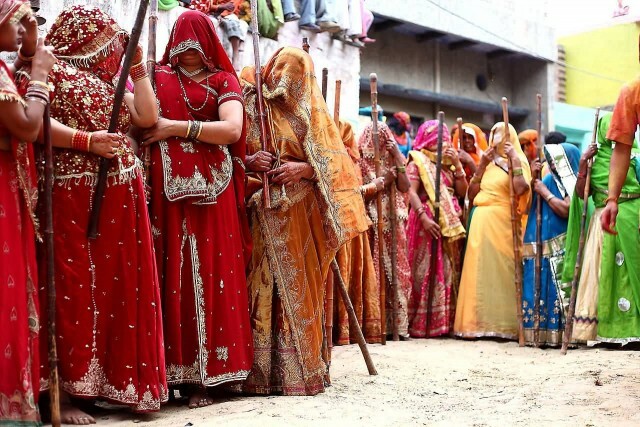 The women of Barsana start preparing a month in advance. It is a show of love, fun and equality. Previous story Which is the most dangerous tree in the world?